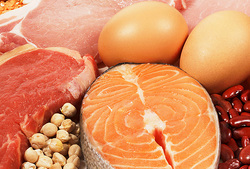 Meat, Seafood, Fish & Eggs - Enlightened Solutions Ltd. - Paleo Nutrition - Designed By Nature. Meat, seafood, fish and eggs are a staple component of an ancestral, species specific diet. Your diet does not need to be heavily meat based (this is a common myth about ancestral diets, such as "paleo"), but we feel that ethically and locally produced meats, seafood, fish and eggs play a role in longterm health. Please use the links in the flyout menu at the left to see our categories.